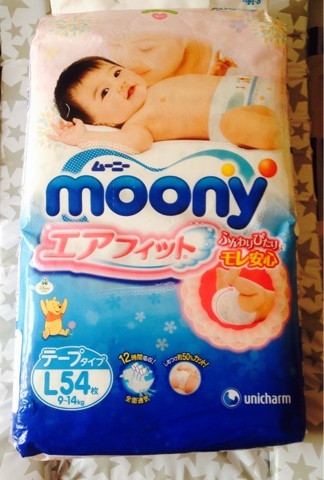 I had never heard of Japanese Moony nappies before being asked to review them. They were packaged like normal nappies but that’s where the similarities to our normal nappies ends. 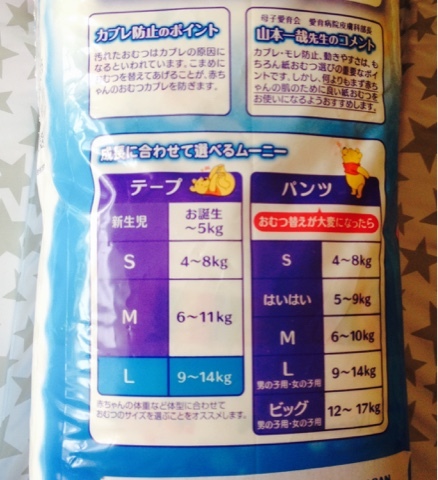 I was sent the large size which is for 9-14kg. Unfortunately they were a size to big for baby girl. But we did try them on her to see how they worked. 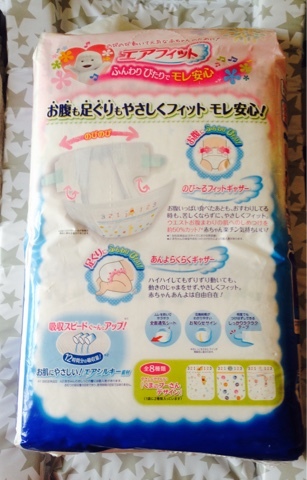 The nappies have a wetness indicator that changes from blue to yellow when wet. I think this is a great little feature as in the UK we only have that on newborn nappies. I don’t know how to read Japanese! but I could get the idea of the features of the nappy by the pictures on the back. Moony nappies have great 3D absorption capabilities and are made from natural organic materials. We found them to be very soft. Much softer than the UK nappies. They are also very pretty designed. 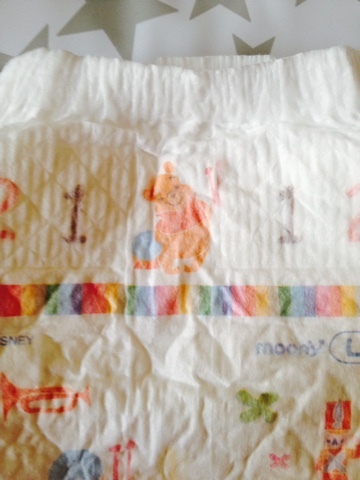 Winnie the Pooh is a great favourite of children’s, so it’s fantastic that it’s incorporated on the nappy. I love the green sticky tabs on the nappies. It makes it much easier to find quickly with a wriggly baby! I have to mention again how soft the Moony nappies are. It’s the unique selling point to me. Silky soft and great for sensitive skin. 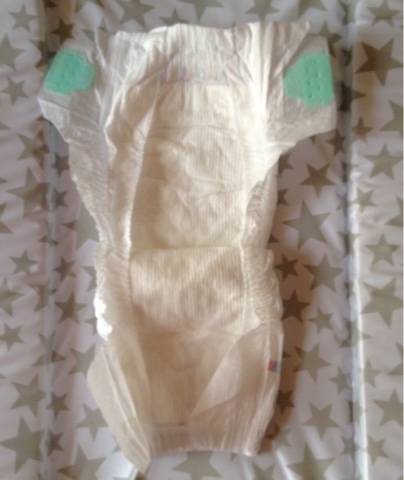 The nappies are also very thin so great for mobility. I had no problems with leaks. 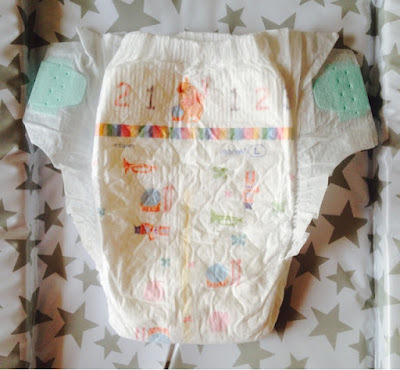 The Moony nappies come in various sizes which are mentioned in kg on the side of the packet. The only negative with the Moony nappies is the cost. They are pretty expensive compared to Aldi nappies and even Pampers. This pack of 54 costs currently £17.49 on Amazon which is on sale from £27.99, at the time of publishing this post. They are authentic Japanese nappies so in my opinion you are paying for shipping from Japan as well as the great Japanese technology inside these nappies. I am giving the Moony nappies 4 out of 5 stars. It would have been 5 but the cost of the nappies dropped it a point. What do you think of these Moony nappies? Are they brand you would try? *I am a part of the Amazon Affiliate scheme so if you click on a link to Amazon and buy, I will receive a little bit back, so thanks if you do. I was sent these nappies to review. All opinions are my honest thoughts.